LITTLETON, Mass. and AMSTERDAM, Feb. 4, 2019 /PRNewswire/ -- Achieving a new level of convergence between AV and IT technology, ZeeVee, Inc., introduced a plug-in module to enable the world's first Ethernet switch featuring integrated HDMI connectivity for video sources, including the capacity to distribute uncompressed 4K/UHD and HDR content. Utilizing ZeeVee ZyPer4K technology in conjunction with the 96-port NETGEAR 10G M4300-96X Modular Managed Ethernet switch, the new ZeeVee module benefits integrators and end-users by enabling unparalleled options for customization, reducing cost, lowering power consumption and greatly simplifying installation and deployment of large IP-based video networks. The new ZeeVee ZyPer4K HDMI Module, developed in collaboration with NETGEAR and the SDVoE Alliance, simply plugs into the NETGEAR switch chassis, providing a robust solution for industrial, commercial and residential applications. 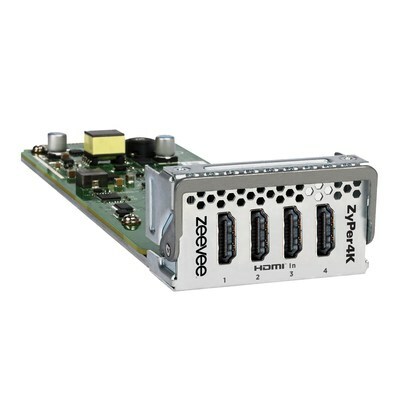 Each ZeeVee module accommodates up to four HDMI sources; multiple modules may be used in the same switch. The NETGEAR switch requires just two units of rack space, presenting a compact, efficient, high-value solution to customers. The ZyPer4K HDMI Module will be on display at the ZeeVee ISE 2019 booth (10-S130, Hall 10). "We are proud to continue our close relationship with NETGEAR and the SDVoE Alliance to, for the first time, enable HDMI source connectivity to an Ethernet switch," said Bob Michaels, CEO, ZeeVee. "This combination of IT and AV at the integrated product level, rather than purely at the infrastructure level, will promote the wider adoption of next generation communications systems." "NETGEAR sees the product pairing of our switch and the ZeeVee ZyPer4K HDMI Module as a significant transformation of the AVoIP experience," said Richard Jonker, vice president of SMB product line management for NETGEAR. "It not only more firmly solidifies the much talked about convergence between AV and IT but makes these systems easier to install and more cost-effective than ever before." The ZeeVee ZyPer4K HDMI Module works seamlessly with the NETGEAR M4300-96X Modular Managed Switch, which is preconfigured for easy, true AV and multicast Zero Touch network configuration. It also allows designers, integrators or users to simply select the combination of HDMI, copper, PoE+ and fiber M4300-96X port expansion cards that suit system requirements, connect cables from sources or decoder-equipped displays, and switch on the power. As with other SDVoE components, the switch easily accommodates symmetric input/output configurations such as 48×48, as well as asymmetric solutions such as 10×86, 24×72, etc. The modular design of the switch allows reconfiguration of inputs and outputs should system requirements change. The ZyPer4K HDMI Module will be available from ZeeVee in Summer 2019. ZeeVee, an authorized NETGEAR reseller, already offers the NETGEAR M4300-96X. More information on the ZeeVee ZyPer4K HDMI Module and the NETGEAR M4300-96X Modular Managed Switch can be found online at link. SDVoE is an initialism for "Software Defined Video over Ethernet". The SDVoE Alliance is a nonprofit consortium of technology providers collaborating to standardize the adoption of Ethernet to transport AV signals in professional AV environments, and to create an ecosystem around SDVoE technology allowing software to define AV applications. The alliance participates in tradeshows and conferences, publishes white papers and case studies and promotes SDVoE technology, and solutions based on the technology, to system integrators, designers and consultants. Training and installer certification are also part of the mandate. The SDVoE Alliance founding members are Aquantia, Christie Digital, NETGEAR, Semtech, Sony and ZeeVee. All interested parties are invited to join the alliance and work toward its goals. For more information, visit sdvoe.org and follow us on Twitter @SDVoE. NETGEAR (NASDAQ: NTGR) is a global networking company that delivers innovative products to consumers, businesses and service providers. The Company's products are built on a variety of proven technologies such as wireless (Wi-Fi and LTE), Ethernet and powerline, with a focus on reliability and ease-of-use. The product line consists of wired and wireless devices that enable networking, broadband access and network connectivity. These products are available in multiple configurations to address the needs of the end-users in each geographic region in which the Company's products are sold. NETGEAR products are sold in approximately 26,000 retail locations around the globe, and through approximately 23,000 value-added resellers, as well as multiple major cable, mobile and wireline service providers around the world. The company's headquarters are in San Jose, Calif., with additional offices in approximately 25 countries. More information is available from the NETGEAR investor page or by calling (408) 907-8000. Connect with NETGEAR on Twitter, Facebook and our blog. ZeeVee (www.zeevee.com) is a global pioneer and leader in the development and deployment of AV distribution systems for industrial, commercial and residential applications. As the only manufacturer that can deliver multimedia content over fiber, CATx and coax, ZeeVee has transformed the digital video industry with its award-winning HD to Ultra-HD/4K solutions for the pro AV and IT marketplace. The company offers a variety of innovative, cost-effective and easy to install AVoIP and RF distribution platforms. ZeeVee's technologies and products are installed in thousands of facilities worldwide where there is a need to transport HD/UHD content from multiple sources to multiple displays over long distances. ZeeVee is a founding member of the SDVoE Alliance and a Global Presence Alliance Technology Partner.